How do I make reservations for the 2019 Allstate Tom Joyner Family Reunion®? To get details and make a reservation, please call 407-248-9191. For registration, we accept credit cards and mailed checks. What is not included in the Family Reunion Package? Will childcare be available on Saturday night? Saturday night childcare will available at an additional cost. It can be purchased in advanced through our Customer Service Reps or on site at the Family Reunion. Reservations may be held with a $500 deposit. Conditions apply. Please see the Package Information page for more information on installment plans and our refund policy. We do not offer trip cancellation insurance. However, we strongly encourage you to consider the purchase of such from a national insurer such as Travel Guard or by typing “travel insurance” into a search engine for other options. Insurers usually require that the purchase of coverage occur near the date of booking. There are a lot of resort properties in Orlando. Which is the host resort for the Allstate Tom Joyner Family Reunion? 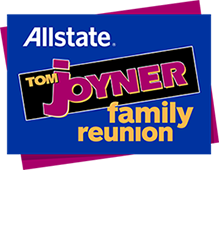 The Gaylord Palms® Resort & Convention Center is the official host hotel for the 2019 Allstate Tom Joyner Family Reunion®. Can I get Internet access in my guestroom? Yes. WiFi is available in the guestrooms and public areas on the hotel side of the property. Each guest room is also equipped with hard lines to plug into your personal computers. Are tips or gratuities included in my package? You do not have to tip on meals and services at Tom Joyner themed events on the host property. But please use your own discretion with other meals and activities that are not a part of your package, as those tips and gratuities are not included. Are minors welcome to this event? Are there accommodations for guests with special needs? Yes. Please inquire at time of booking or at any time by calling the reservation line at 407-248-9191. Tell me more about the accommodations. How are the rooms equipped? Included in your package are select meals. The host resort offers a full array of room service, quick service and fine dining options. Click this link to learn more about dining at the Gaylord Palms® Resort & Convention Center. How can our family extend our stay? For information on how to extend your stay call 1-407-248-9191. I’m interested in being a vendor or exhibitor at the Family Expo. What steps do I need to take? For details on participating in the Family Expo as a vendor or exhibitor, please email us at Expo@ReachMediaInc.com. Notice Disney Parks are not included, have not been to the reunion in a while. Are Disney Park passes not included any more? If not, can they be purchased at a discount. If I purchase concert tickets only can my child attend kids nite out while I’m in the concert? If you live in Orlando and only need activity tickets, how do you purchase? Do you have separate event tickets only? Our family reunion is in Orlando and we would like to attend some activities but don’t need hotel.